Meeting of Hannibal and Scipio at Zama. Adapted from Young Folks' History of Rome by Charlotte Mary Yonge. “Battle of Zama.” Wikipedia.com. Wikipedia. Web. 16 Feb. 2012. The first Punic War (264-241 B.C.) began as a small conflict in Sicily which quickly escalated into an all out war between Carthage and Rome (“Punic Wars”). The Romans won many of the battles, and the war eventually ended with a peace treaty that gave the Romans control of Sicily. Twenty-two years later (219 B.C.) Hannibal “attacked Saguntum in Hispania, a city allied to Rome, starting the second Punic War” (“Punic Wars”). After suffering a major defeat at Cannae, the Roman armies under the direction of Publius Cornelius Scipio (Scipio Africanus) traveled to Africa and prepared for the Battle of Zama. From the accounts given of him, Scipio Africanus appears to have been not only a strong general, but also a capable politician in the time surrounding the battle of Zama. There was significant initial resistance to Scipio’s plan to attack the Carthaginians in their own territory by the Roman Senate. They were “persuaded by Fabius Maximus that the enterprise was far too hazardous” (“Battle of Zama”). However, Scipio, who had been elected a consul because of his recent victories against the Carthaginians, apparently had enough political savvy and support to convince the Senate to let him go, but not enough to convince them to supply him with an army of anything more than volunteers (“Battle of Zama”). Eventually he did receive the support of formal troops. Scipio’s language during the battle of Zama also indicates political savvy. Polybius recounted that Scipio’s reply to a speech made by Hannibal at the beginning of the battle was “That neither in the Sicilian nor Iberian war were the Romans the aggressors, but the Carthaginians” and that “the gods themselves had confirmed this by giving the victory…to those who acted only in self-defense” (Polybius 15.8). This is, of course, frankly false. The first Punic War was started because of offenses on both sides, but Scipio’s statement, if recorded accurately, would have served to validate the actions of his troops and intimidate his enemies. Though it is possible that Polybius may have distorted Scipio’s language in order to strengthen the “righteous” image of the Roman army in the second Punic War, and though it is possible that Scipio himself may have believed that they Romans were completely innocent, it is not outside the realm of possibility that Scipio might have used such a tactic purposefully to his advantage. One of the strongest indications of Scipio’s political prowess, however, came at the end of the battle. 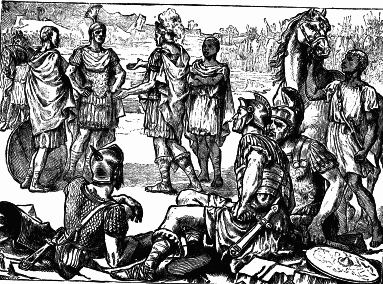 As part of the treaty to end the war after the Carthaginians had been defeated, Scipio requested various things including “a hundred hostages of their good faith, —such hostages to be selected from the young men of the country by the Roman general, and to be not younger than fourteen or older than thirty years” (Polybius 15.18). According to M. James Moscovish, “the Senate had authority to amend treaty clauses issued by its generals in the field, but in the case of Scipio’s terms with the Cartheginians…the Senate ratified them without change” (418). Though the Senate might have changed any number of terms in the treaty, they remained satisfied with Scipio’s decisions. This seems to indicate that Scipio had either enough insight into the Senate to create a treaty that supported their interests, or enough influence because of the significance of his victory that the Senate wanted to pacify him. Either way, Scipio’s political and military abilities during the battle of Zama significantly impacted the empire. “Battle of Zama.” Wikipedia.com. Wikipedia. Web. 16 Feb. 2012. Polybius. Histories. Perseus Digital Library. Ed. Gregory R. Crane. Tufts University. Web. 16 Feb. 2012. “Punic Wars.” Wikipedia.com. Wikipedia. Web. 16 Feb. 2012.